Davidson , Debra. "Climate Change". The Canadian Encyclopedia, 13 September 2018, Historica Canada. https://www.thecanadianencyclopedia.ca/en/article/climate-change. Accessed 20 April 2019. Climate change occurs when long-term weather patterns begin to shift. These periods of change have occurred throughout the Earth’s history over extended periods of time. However, since the Industrial Revolution the world has been warming at an unprecedented rate. Because of this, the current period of climate change is often referred to as “global warming.” Human activities that release heat-trapping greenhouse gases, such as the burning of fossil fuels, are largely responsible for this increased rate of change. The implications of this global increase in temperature are potentially disastrous and include extreme weather events, rising sea levels and loss of habitat for plants, animals and humans. In Canada, efforts to mitigate climate change include phasing-out coal-fired power plants in Ontario and instituting a carbon tax in British Columbia. Earth's average surface temperature has risen by about 0.7°C since 1880. Climate is often mistaken for weather, but it is more accurately described as the conditions that give rise to weather, including, for example, average temperatures and humidity (see also Climatology). Climatic conditions are created by geological features, like topography and large water bodies. They are also affected by the composition of the atmosphere, which has a significant effect on air temperatures. While weather in a given place can be quite variable, climatic conditions are not. This does not mean that the climate does not change, however. The climate has been in a continual state of change throughout geological history, which has given rise to repeated cycles of cooling and warming. The last cold period, known as the ice age, peaked approximately 18,000 years ago, after which a slow warming caused most of the ice sheets covering North America to melt over the ensuing 14,000 years (see also Glaciation). Gases that trap heat in the atmosphere. There are several different types of greenhouse gases, but two in particular are responsible for climate change: carbon dioxide (CO2) and methane (CH4). This time period is often used as a point of comparison for current temperatures and rates of global warming. It refers to the years before industrialization was complete in Europe and North America, or in other words, the years before the late 1800s. A carbon sink is any natural or technological process that absorbs carbon from the atmosphere. Trees, soils and oceans are the most important natural carbon sinks, but all three are limited in the amount of carbon they are capable of absorbing. Feedback loops can be positive or negative, and refer to outcomes of a given process that can elevate or dampen the effect of the process itself. Climate change impacts that serve to contribute to further global warming are a type of positive feedback loop. A term used to describe changes to nature caused by humans. One of the main ways scientists observe change in climate is by measuring average temperatures at the global or regional scale and evaluating changes in those temperatures over time. 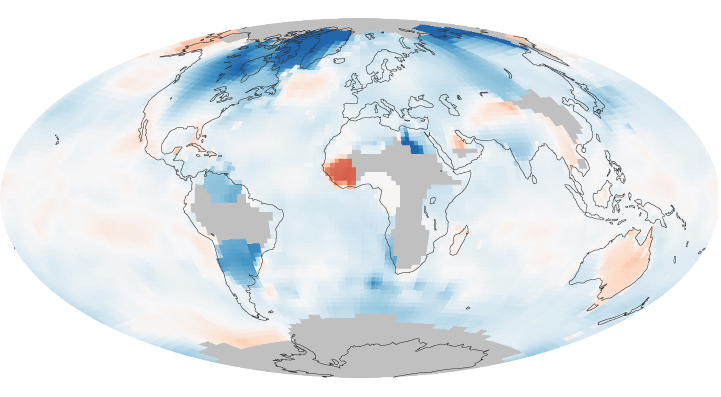 Scientists calculate the global average annual temperature at the Earth’s surface by collecting temperature data from weather stations located all around the world, which have been around since the 1880s. In order to estimate temperatures before the existence of these weather stations, scientists analyze biological or physical phenomena such as tree rings, which can provide estimates for historic climatic conditions. They have also been able to observe changes in climate by observing other variables, like precipitation, humidity and cloud cover. How Fast is the Earth Warming? For most of geological history, the rate of change in climate has been quite slow. The rate of climate change since the Industrial Revolution, however, is historically unprecedented, such that global average temperatures today are nearly 1°C above pre-industrial levels. Although the change seems small, for the global climate one degree of warming can cause significant shifts in weather patterns, water cycles and ecosystems. During the early 21st Century, worldwide temperature records have been repeatedly broken, including July 2016, now recognized as the hottest month in recorded history. The increase in the rate of climate change has been attributed in large part to human activities. Scientists have known that human activities were theoretically capable of changing the climate ever since British scientist Guy S. Callendar brought that theory to light in 1938. His theory has since been irrefutably confirmed. Any human activity that results in the emission of heat-trapping gases, called greenhouse gases, into the atmosphere contributes to an increase in global average temperatures. There are several different types of greenhouse gases, but the most significant is carbon dioxide (CO2), and secondarily, methane (CH4). The human activities that generate the most greenhouse gases are the burning of fossil fuels like coal, oil and natural gas. These resources have high carbon content, which is released when they’re burned in power plants, buildings or vehicles. Scientists estimate that about 70 per cent of man-made greenhouse gas emissions come from burning fossil fuels, particularly coal. Changes in land use, including deforestation and agriculture, also have an effect on climate change by influencing two of the most important carbon sinks: trees and soils. Scientists have linked the rise in global temperatures to human activity through research in Antarctica and Greenland. By analyzing air bubbles trapped in ice cores in these regions, scientists can determine what the atmosphere was like up to 800,000 years ago. With this research, they have been able to establish two key findings: First, there is a clear relationship observed throughout geological history between the concentration of CO2 in the atmosphere and temperature. Second, the level of CO2 in the atmosphere remained relatively stable until the Industrial Revolution, after which the concentration began to climb considerably. Before the Industrial Revolution, the concentration of CO2 in the atmosphere was approximately 280 ppm (parts per million). As of 2015, CO2 reached 400 ppm —the highest it has been in some 650,000 years — and there is no natural source of CO2 that can explain this increase. The amount of carbon dioxide in the atmosphere has increased rapidly since the Industrial Revolution. Scientists have also been able to project future climate conditions, through the use of complex computer models called general circulation models. The sophistication and accuracy of these models have improved considerably over time with advances in computing technology. These models are used to estimate the likely future climate conditions under differing greenhouse gas emission scenarios. If the pace of increase in greenhouse gas emissions observed in the previous 50 years continues unabated throughout the 21st century, these models project that global average temperatures will continue to increase at a worrying rate, reaching 2°C above pre-industrial levels by 2050, and exceeding 4°C by 2100. As sophisticated as they are, global climate models cannot project more specific or local-scale conditions, such as whether or not 2020 will be a drought year in Alberta. Some scientists also speculate that these projections may be conservative, because they do not include several positive feedback loops that can further intensify the rate of warming. One notable feedback loop is the melting of permafrost. Much of the soils in the Arctic have been permanently frozen, but they are beginning to thaw as temperatures rise. 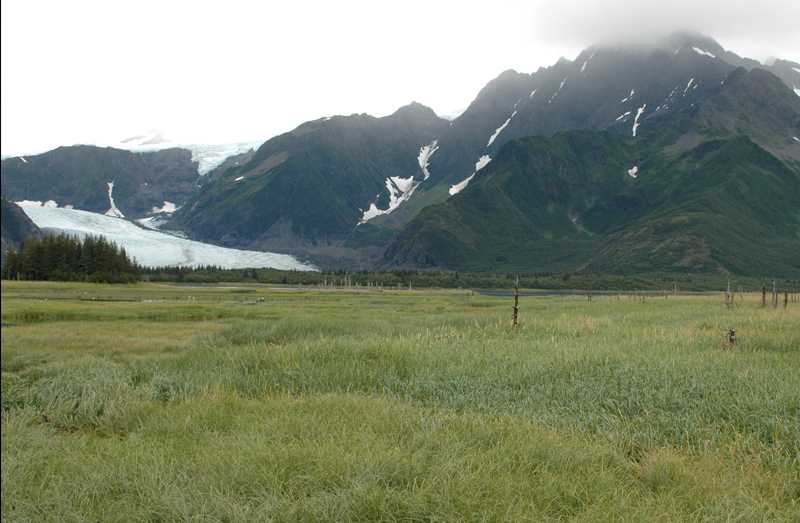 These soils have a large amount of carbon dioxide and methane trapped in them, which is released when they thaw. Methane is 84 times more effective than CO2 at trapping heat in the atmosphere. A second feedback loop is the potential heat given off by oceans. 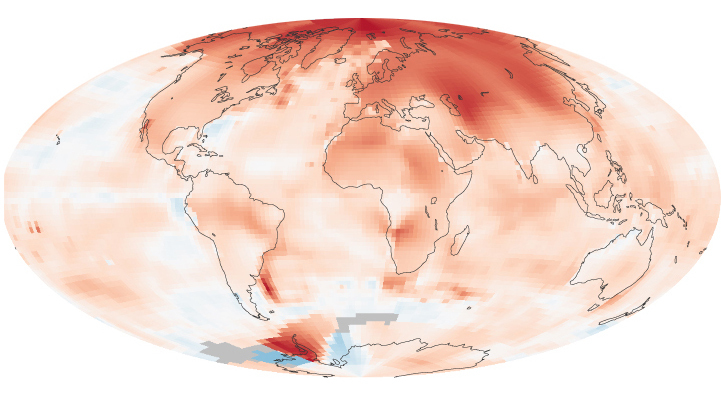 The oceans have absorbed much of the heat that has been added to the atmosphere over the past century, but the oceans’ ability to continue to serve as a heat sink is not indefinite. Eventually, the energy stored in the oceans will be released back to the atmosphere, causing more warming. What is the Impact of Climate Change? The impacts of an increase in global average temperature are far-reaching and potentially disastrous to plant, human, animal and marine life. One of the most acute impacts is sea level rise, due both to the melting of land ice and the warming of oceans. Average sea levels rose approximately 20 cm over the 20th century, and the rate of increase is growing. Sea levels are likely to rise by at least 1 m in response to historic emissions, although it is uncertain how many decades it will take to reach these levels. Some research suggests that the rise may be much greater if emissions continue to increase. Even at 1 m, millions of people living along coastlines are at risk, including residents of Vancouver, and several other Canadian cities. Many low-lying island nations would become completely uninhabitable. Other impacts of concern have already been observed, and are projected to increase in future decades. These include extreme weather events, such as droughts, heat waves and extreme storms, which can be expected to increase in frequency and intensity in a warming climate. Increases in these events, in turn, create conditions for other negative impacts, like forest fires and crop failures. Projected declines in agricultural productivity (which have already been observed in some regions) are a particular concern, considering its direct relationship to food security. 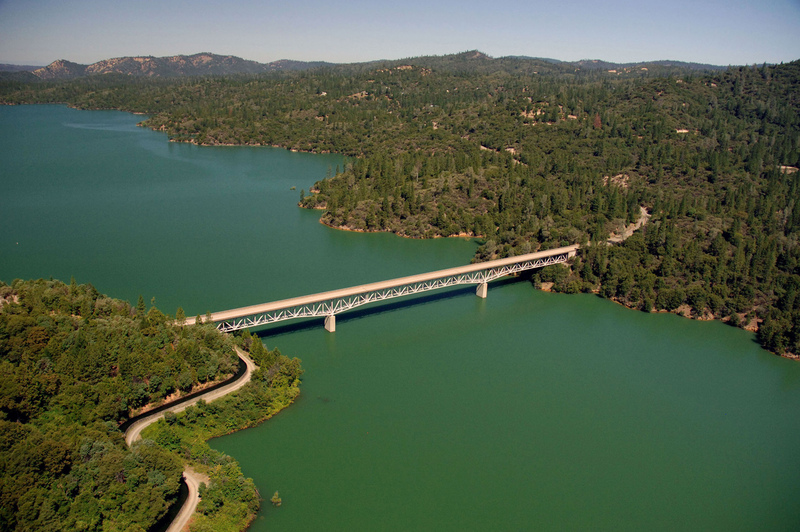 20 July 2011: The Green Bridge passes over full water levels in Lake Oroville, California (photo by Paul Hames/California Department of Water Resources via Getty Images). 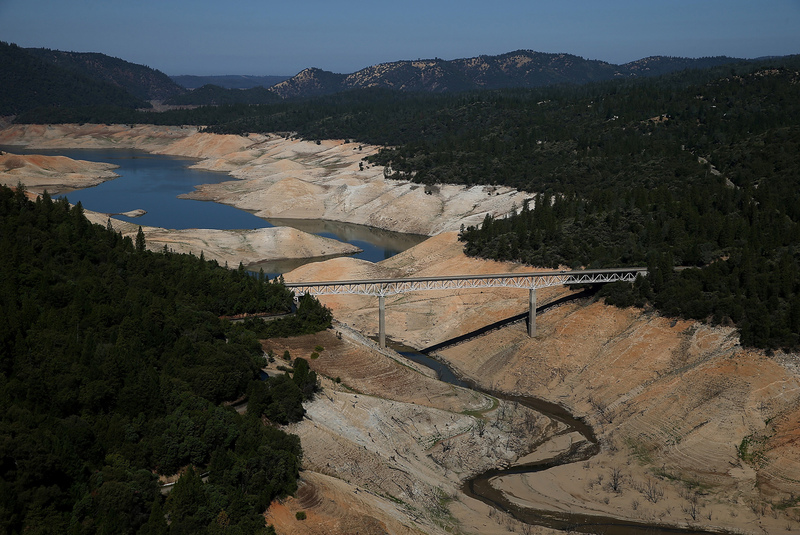 19 August 2014: The Green Bridge passes over low water levels in Lake Oroville, California. Ongoing, severe drought in California led to historic lows in the State's lakes and reservoirs (photo by Justin Sullivan/Getty Images). Water supplies are affected by changes in climate as well. Western Canada is already experiencing glacial	melting, and a greater proportion of precipitation falling as rain rather than snow, which affects everything from winter sports to surface water availability in the summer. Climate change also has a direct impact on ecosystems. Plants and animals are highly sensitive to shifts in temperatures and water cycles. They can migrate, but only if they have someplace more habitable to migrate to, and if they are able to move faster than the climate changes. For most species, that means migrating toward the poles and higher elevations. Canada’s mountain species are especially at risk, since there is nowhere for them to go. Since 2010, a number of studies have been released with a similar message: observations of the pace of change resulting from increases in global average temperatures in everything from sea level rise to ocean warming to glacial melt have far surpassed earlier model projections. Most alarmingly, based on analysis of a period of earth’s history in which estimated global average temperatures were similar to today’s, one study authored by 17 prominent climate scientists in 2015 projected sea levels to rise as much as 3 meters in 50 years, even at just 2°C of warming. Summer 1917 (photo by Louis H. Pedersen). Summer 2005. 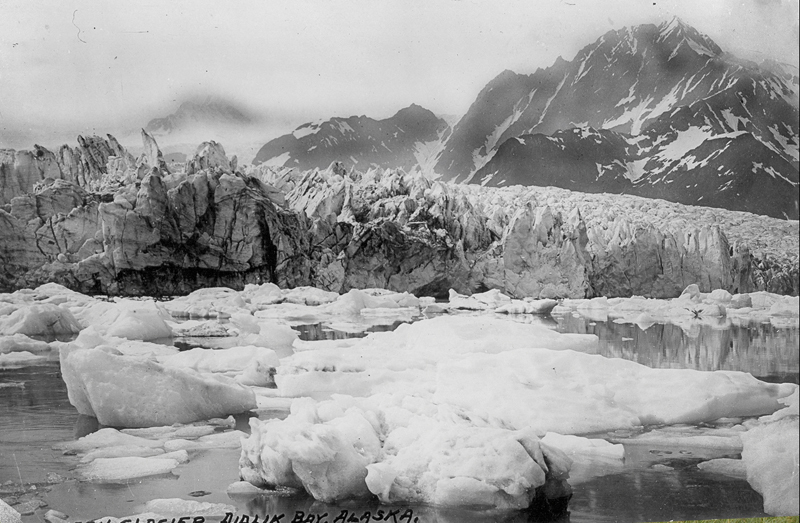 Melting glaciers are one of several factors contributing to rising sea levels worldwide (photo by Bruce F. Molnia). In effect, humans have never before experienced the climate conditions that have already begun to characterize the 21st century, raising the need for adaptation. Even if emissions were completely halted today, significant impacts would still occur in the future, because the greenhouse gases currently in the atmosphere will continue to have an effect on the climate for several decades. Those who are most vulnerable include people who live in areas highly exposed to extreme impacts, such as sea level rise, and those who have limited access to the resources needed to adapt, such as knowledge, social support networks and money. Governments at all levels are beginning to take adaptation seriously, by conducting vulnerability assessments to identify the groups, economic sectors and infrastructures most vulnerable, and developing adaptation plans accordingly. Some individuals and businesses have begun to adapt as well, by investing in building weatherization, for example, but there is still a long way to go to prepare social and economic systems for a rapidly changing climate. One of the core elements of the Framework was the establishment of an international scientific body to assess the state of knowledge about climate change, a responsibility subsequently delegated to the Intergovernmental Panel on Climate Change, established by the World Meteorological Association in 1988. This group has become the leading authority on climate science ever since. Signatories to the convention meet annually to assess progress in reaching their goal in meetings called the Conferences of the Parties (COP). Conference assessments have not been optimistic. In fact, global emissions of CO2 grew 45 per cent between 1990 and 2010. One thing signatories have agreed on is a specific target: warming should not exceed 2°C above pre-industrial temperatures. As of 2015, the world is already halfway there. In December 2015, the 21st annual meeting of the COP (COP21) was held in Paris. The meeting generated the Paris Agreement — a historic document outlining the ways in which the international community will cooperate to keep warming below 2°C. The agreement’s key points include the aim to keep warming to 1.5°C above pre-industrial temperatures by reducing emissions, meetings every five years in order to set more ambitious targets, and financial support for developing countries. Nearly 200 countries have signed the agreement, including Canada. The goal to limit the warming caused by greenhouse gas emissions to 1.5°C comes as scientists suggest that even if global temperatures stabilize at 2°C of warming, there will still be significant negative impacts. If temperatures increase much beyond that there is a high probability of destroying many of the ecological and meteorological conditions that support society. Mitigation includes three basic strategies: First, the amount of greenhouse gases being emitted by human activities can be reduced. This is what is called conventional mitigation, and it generally implies making changes in the ways energy is consumed, either by using less, or switching to alternative fuels that emit little or no carbon. Second, emitted carbon can be captured before it is released into the atmosphere and stored underground. This is called carbon capture and storage (CCS), and has started to be implemented in a handful of power plants to date, one of which is in Saskatchewan. However, carbon capture is expensive, and governments are a long way from implementing CCS at a scale that would be necessary to influence change. Third, certain approaches are capable of removing the carbon that currently exists in the atmosphere. This can include simple strategies like reforestation, since trees absorb carbon, as well as more technologically advanced mechanisms. A fourth strategy, still only at the sidelines of discussion, involves “geo-engineering,”which entails efforts to control the climate by manipulating the Earth’s systems in various ways. An example of this is the process of cloud seeding,an attempt to increase precipitation from clouds by dispersing substances, primarily solid carbon dioxide (dry ice) and silver iodide, into them. Geo-engineering techniques are still considered highly speculative, and are associated with significant risks of unintended negative impacts. How Much Mitigation is Needed? With the global lack of progress on reducing greenhouse gas emissions since the establishment of the United Nations Framework Convention on Climate Change, the need for rapid mitigation has become more urgent than ever. In 2018, the Intergovernmental Panel on Climate Change released a report that confirmed that limiting global warming to 1.5°C could substantially reduce the impacts of climate change. However, the report also indicated that in order to accomplish this net greenhouse gas emissions would need to be reduced to zero by 2040. Pledges made by governments around the world to reduce emissions fall far short of what is needed to achieve this goal, including the pledges made in the lead-up to the 21st Conference of the Parties. In many countries of the developed world, emissions have largely stabilized, and in some countries, they have gone down. But in other parts of the world this is not the case. China now dwarfs other countries in emissions levels, and they are expected to continue increasing these levels for at least another 10 years. Moreover, it will take much longer for China’s emissions to decline. The question of who is responsible for implementing mitigation strategies is difficult to answer and is ultimately political. The complexity of this question is a primary reason that international efforts to mitigate climate change have been met with such limited success. Should those countries that have emitted the most historic emissions bear the most responsibility? Should rapidly developing countries like China and India have the right to increase their emissions in an effort to develop their national economies? Should countries like Canada, which are well-endowed with fossil fuels and are economically dependent on their development, be prevented from extracting them? There are simply no easy answers to these questions. Those who don’t accept the science of climate change are often referred to as climate change deniers. This small group of organizations and individuals stand to lose a lot if fossil fuel consumption is reduced, and their influence is part of the reason political responses to climate change have been slow in Canada and other parts of the world. For example, ExxonMobil, an oil and gas company based in Texas, has promoted climate skepticism, particularly through providing financial support to conservative think tanks: advocacy organizations such as the American Enterprise Institute in the United States, or the Fraser Institute in Canada. These organizations support conservative ideologies, often under the guise of objectivity. A study published in 2013 found that a large proportion of climate change denial books are linked to such organizations — books that are generally not peer-reviewed or written by scientists. The central claims of skeptics have evolved over time from an initial assertion that the science supporting climate change is unsound. Two additional assertions have been added to this claim: that global warming is a natural phenomenon; and among some, that the impacts of climate change will be beneficial, and therefore do not warrant investments in mitigation. One of the most effective strategies invoked by skeptics to support their arguments is to assert that the science of climate change is too uncertain to warrant a response. In fact, the 100 per cent confidence demanded by skeptics is an unrealizable goal, as scientific methods are not capable of producing such levels of certainty. Upwards of 97 per cent of scientific papers published between 1991 and 2011 agreed that climate change is caused by humans; this represents a considerably high degree of consensus. Survey research shows that climate skepticism has been highly influential in three countries in particular: the US, where 54 per cent of citizens agree that climate change is caused by humans; and the UK and Australia, where 64 per cent agree. In the same survey — conducted by Ipsos MORI in 2013 — 71 per cent of Canadians agreed with the statement. According to research done in the United States, those most inclined to support the arguments of skeptics include politically conservative, white men. However, climate skepticism appears to be declining. An increasing number of prominent financial institutions, industry organizations and politicians formerly allied with climate skeptics have publicly stated their acceptance of and concern for climate change. In the wake of these assertions, skeptics are increasingly marginalized. In September 2015, for example, 10 congressmen from the US Republican Party went against their party’s official stance and called for climate change action. Just a few months earlier, Pope Francis, head of the Catholic Church, began preaching the importance of a global response to climate change. Moreover, the judiciary has weighed into climate decision-making, with a Dutch court in 2015 ordering the Dutch government to support deep emission cuts in order to protect basic human rights. Influential institutions like the International Monetary Fund, the World Bank, the Organization for Economic Cooperation and Development, the World Health Organization and the International Energy Agency have all established climate change mitigation as a high priority. In addition, a variety of major fossil fuel companies including Royal Dutch Shell, Total and Canada’s Suncor have expressed the need for urgent political action to mitigate climate change. Indeed, survey research suggests that public opinion is also beginning to shift against the arguments of the denial movement. How is Canada Responding to Climate Change? Canada emits 2 per cent of global emissions, which sounds small, but when the size of the population is considered, Canada is actually among the highest per capita emitters in the world. These high emission levels are due in part to a few greenhouse-gas intense sectors in the national economy, particularly the energy industry, but the fact that Canada is a large and cold country also matters. 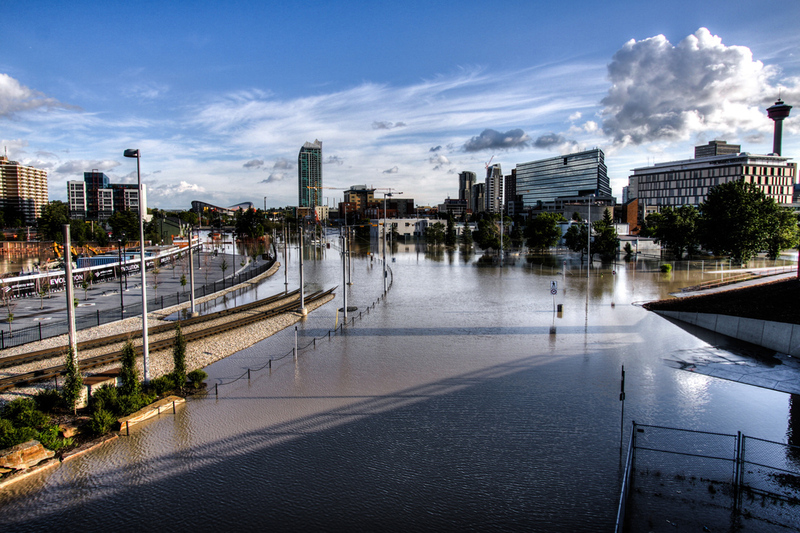 Water engulfed Calgary's East Village when the southern quarter of Alberta flooded in 2013. The extreme weather event — typical of climate change — forced as many as 100,000 people from their homes. 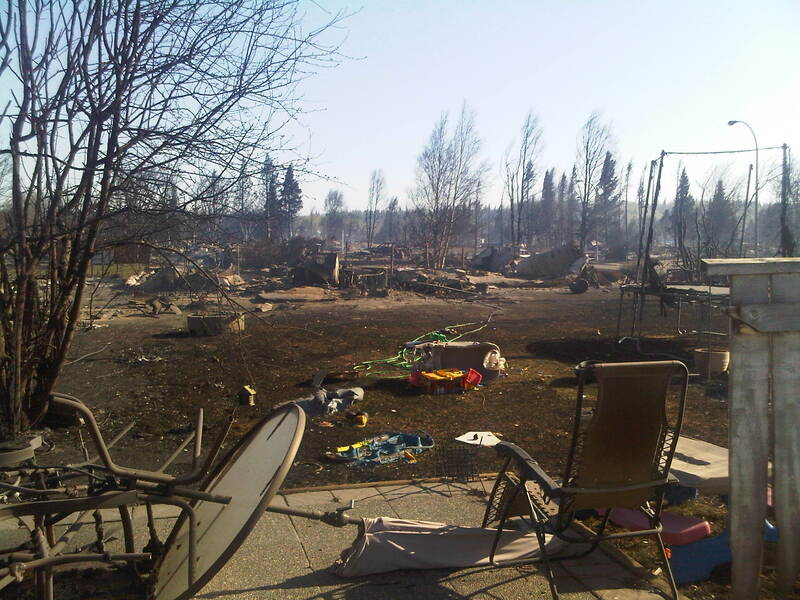 In May 2011, forest fire ravaged the town of Slave Lake, Alberta, displacing 7,000 people. Canadians are experiencing an increasing number of forest fires as climate change leads to drier woodlands. In 1997, Canada signed the Kyoto Protocol, a treaty that extended the goals of the UNFCCC to include specific national mitigation targets. The protocol was ratified by Parliament	in 2002. However, the federal government did not put into place strategies that would enable the country to meet its targets. Canada's Kyoto target was an average 6 per cent reduction in emissions from 1990 levels between 2008 and 2012. Instead, between 1990 and 2008 national emissions increased 24 per cent, and in 2011, the federal government withdrew from the Kyoto Protocol. Many provinces and cities across Canada, however, have taken significant actions to enable reductions in greenhouse gas emissions. The Province of Ontario, for example, determined to phase out coal-fired power plants in 2002, and in 2014 managed to do just that. The plants were replaced with renewable (e.g. wind) and lower-emission sources (e.g. natural gas). British Columbia, on the other hand, is among the first jurisdictions in the world to institute a carbon tax, initiated in 2008. Studies suggest the tax has contributed to a decline in fuel use in the province. In addition, in 2015, the mayors of 21 of Canada’s largest cities signed a resolution of commitment to binding emission reduction targets, and the development of municipal climate action plans. Intergovernmental Panel on Climate ChangeThe IPCC is one of the leading international organizations assessing climate change and its impacts. Click here to download a shortened version of their 2014 report. Global Carbon ProjectExplore this international organization’s website and find interactive maps with country-specific emission rates, reports and further Internet resources. Le Groupe intergouvernemental d’experts sur l’évolution du climat (le IPCC)L’une des organisations phares sur le plan international se penchant sur la question des changements climatiques et de leurs impacts. Cliquer ici pour télécharger une version abrégée de leur rapport de 2014.